Photographer(s) Appreciation: >A thank you to Kerry D. Woods (on Flickr) for sharing today's photograph via the Botany Photo of the Day Flickr Pool (original image). Much appreciated! Kerry took this photograph in early March of 2009 in Anza-Borrego Desert State Park, California. Monoptilon bellioides is an annual herbaceous species, one of two recognized species in the genus. Both Monoptilon species are native to southwestern North America. Commonly named Mojave desertstar, Monoptilon bellioides is found in California, Nevada, Arizona and Baja California at elevations of 100-900m (325-2950ft.) in “sandy or gravelly flats or washes, dunes”, as noted in the link. More photos of this small plant (to 25cm (10in.) can be browsed on CalPhotos: Monoptilon bellioides. For comparison with the original mistaken identity, see Eriophyllum lanosum. The plant shown is Monoptilon bellioides, not the somewhat-similar flower of Eriophyllum lanosum. Monoptilon has short spreading hairs on its leaves and stem, as seen in the largest version of the photograph at Flickr, whereas Eriophyllum has woolly appressed hairs. The ray flowers of Monoptilon are spreading to somewhat ascending, whereas the ray flowers of Eriophyllum are typically a bit descending. E. lanosum is only found significantly south and west of Split Mountain Road, whereas Monoptilon bellioides is common along Split Mountain Road. Kerry sent along a comment suggesting that this may be misidentified and instead Monoptilon bellioides. It’s hard to tell from the flowers, but the leaves suggest (in most cases) that it may indeed be Monoptilon. Anyone with a bit more familiarity with Californian desert flora care to comment? I was the one who sent in the original comment, without registering first, and didn’t realize it wouldn’t be posted without registering. I didn’t have time to register then. OK, here’s my comment for public consumption. 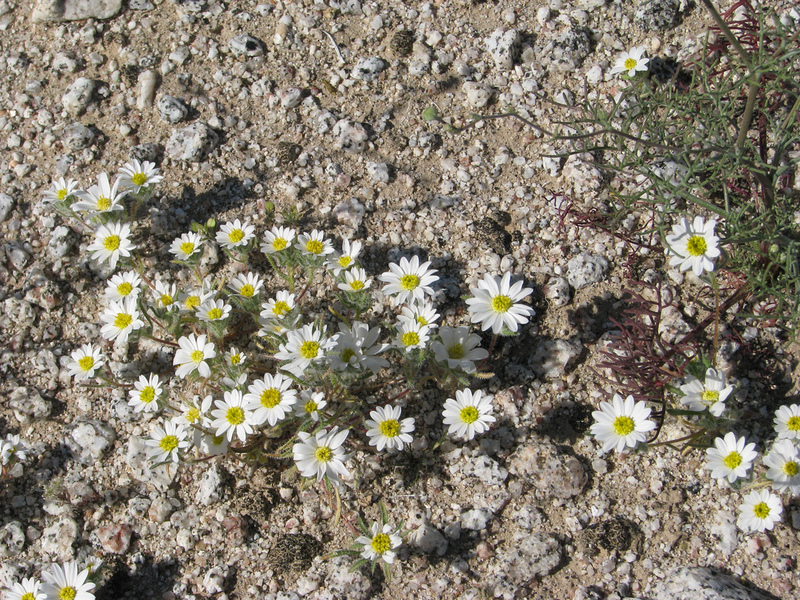 The plant shown is Monoptilon bellioides, not Eriophyllum lanosum, which indeed has a somewhat-similar flower. Monoptilon has short spreading hairs on its leaves and stem, as seen in the largest version of the photograph at Flickr, whereas Eriophyllum has woolly appressed hairs. The ray flowers of Monoptilon are spreading to somewhat ascending, whereas the ray flowers of Eriophyllum are typically a bit descending. You are far from the first to confuse these two, since the flower is indeed so similar. E. lanosum is only found significantly south and west of Split Mountain Road, and is fairly uncommon in the Borrego Desert, whereas Monoptilon bellioides is common along Split Mountain Road and throughout the Borrego Desert. I’ve been working on the Borrego Desert Flora actively since 2005, and know both of these species quite well. I thought you might be interested in “the rest of the story”. A friend of mine in Arizona had been worried he had only been seeing Eriophyllum lanosum there so far this year, and not Monoptilon. When he was looking at pix on the web to see if he might have been confusing these species, he found one at a website of a very good botanist that really confused him, since it was a picture of Eriophyllum lanosum misdetermined as Monoptilon. As part of the followup discussion with a few people, one of them brought this botany pix of the day to my attention. Subsequently, another excellent botanist reported that he had misdetermined an E. lanosum as Monoptilon just in the last week. It is clearly very easy to confuse these species, and I’ve undoubtedly done so in the past at times in the field and was corrected by my companions. If you really want confusion, our white ligule version of Eriophyllum wallacei, the former var. rubellum, is a dead ringer for E. lanosum, and has confused yet more people. The only unambiguous way to tell the difference is by looking at the pappus, which is hardly ever visible in a picture. E. lanosum is absent in the northern part of the Anza Borrego Desert, so last year I made a special effort to go see it in the Mason Valley area to compare it to our white version of E. wallacei. Thanks Tom — actually, your first comment got caught up in the spam filter for whatever reason (who knows). You shouldn’t have to register to comment, but I’m certainly glad you’ve added your thoughts. I’ll correct this entry tomorrow morning.